RAWALPINDI: The Anti-Narcotics Force seized 913.26kg narcotics valuing Rs 1.6 billion in the international market and arrested 28 persons, including an Afghan national and four women allegedly involved in drug smugglinsg and impounded 7 vehicles while conducting 25 counternarcotics strikes across the country. The seized drugs comprised 760 Kg Opium, 134.55 Kg Hashish, 12.7 Kg Heroin, 3.2 Kg Amphetamine and 1.3 Kg Methamphetamine. 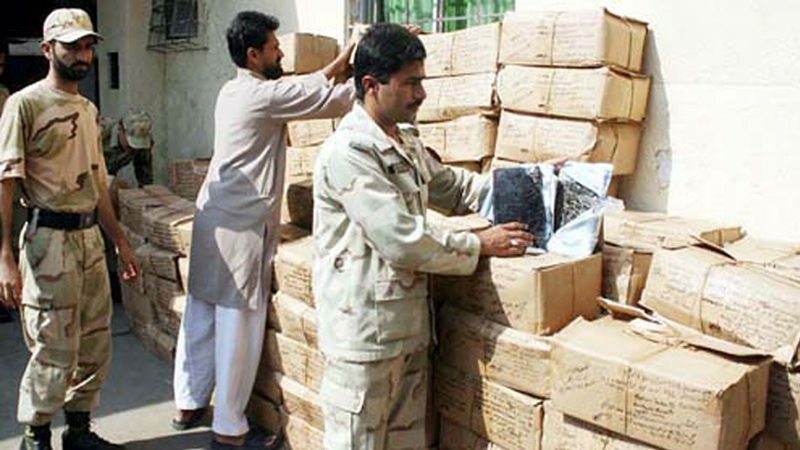 ANF Quetta in an intelligence based operation carried out at District Chaghi seized 700 Kg Opium. According to details, the drug was stocked at an isolated site situated at general area near Gawala Stop, Killi Wadiya, District Chaghi. In another operation, ANF intercepted a motorcyclist identified as Muhammad Naeem, resident of Qilla Abdullah near Graveyard, Killi Kotwal Road, Quetta and recovered 20 Kg Hashish from his personal. Yet in another operation, ANF Quetta intercepted motorcycle at general area of Kochi, Tehsil Dalbandin, District Chaghi, however, the person on board managed to escape from the scene taking advantage of darkness, leaving the motorcycle unattended. Search of the luggage loaded on the bike resulted in recovery of 35 Kg Opium. Moreover, ANF Quetta arrested a motorcyclist namely Sher Dil resident of Quetta near Environmental Protection Office, Quetta, recovering 29.1 Kg Hashish from his personal possession. ANF Rawalpindi while acting upon a tip-off intercepted a Mazda Truck near Chhach Interchange, Attock, recovering 75 Kg Hashish and 25 Kg Opium concealed in improvised cavities of the truck. A person on board identified as Muhammad Asad resident of Jhang was apprehended during the operation. In another operation, ANF Rawalpindi arrested Amjad Pervez resident of Attock and Saeeda Gul resident of Peshawar from GT Road, near Iqbal Shaheed Toll Plaza, Attock while they were travelling on a Motorcycle and recovered 2 Kg Hashish from them. ANF Lahore recovered 280 Grams Hashish by arresting two local drug peddlers identified as Asim Masih and Sagar Masih both residents of Lahore. They were arrested near ShoukatKhanam Hospital, Lahore. In another operation, ANF Lahore arrested Arshad Masih and Rafaqat Masih both residents of Lahore, involved in local drug peddling and recovered 250 Grams Hashish from their personal possession. They were arrested near University of Management and Technology, Faisal Garden, Lahore. Yet in another operation, ANF Lahore arrested two drug peddlers including Muhammad Ali and Muhammad Ramzan both residents of Lahore along with 290 Grams Hashish found in their personal possession. They were arrested near Educational Institute, Johar Town, Lahore. In addition, ANF Lahore also recovered 160 Grams Hashish from possession of an accused namely Yasir Hafeez resident of Lahore who was arrested near Bibi Pak Daman Bazar, Lahore. As per reports, the most of the accused persons were involved in distribution of drugs in educational institutions. In fifth operation, ANF Lahore in joint operation with Punjab Rangers carried out a raid near Jamia Masjid Ya Rasool Allah, Kuli Saho, Tehsil Chunian, Qasur and arrested a local drug peddler Muhammad Boota recovering 10 Kg Heroin from the accused. In sixth operation, ANF Lahore seized 1 Kg Heroin from a shipment being sent to Netherland through a private courier service company based at Allama Iqbal InternationalAirport, Lahore. Heroin was tactfully concealed in 4 books. ANF Peshawar intercepted a Suzuki Mehran car near Kharkhano Phatak, Industrial Estate, Hayatabad, Peshawar and recovered 2.4 Kg Hashish concealed in it. A drug carrier identified as Muhammad Sajid resident of Khyber Agency was also apprehended during the operation. In another operation, ANF Peshawar arrested a Riyadh bound passenger identified as Gul Zar resident of Peshawar at Peshawar Airport and recovered 1.06 Kg Amphetamine concealed in his hand bag. He was to take off by PIA Flight No. PK-672. Yet in another operation, ANF Peshawar in collaboration with ASF at Peshawar Airport arrested four passenger identified as Asif Ali, Nargis Begum, Noor Sahib Jan, residents of Kohat and Bibi Zainab Jan resident of Orakzai Agency, recovering 2.155 Kg Amphetamine concealed in their trolley bags. They were boarding for Riyadh by PIA Flight No. PK-674. In addition, ANF Peshawar also seized 1.7 Kg Heroin from a shipment being sent to UK through a private courier service company based at Namak Mandi, Peshawar. Heroin was concealed in marbled decoration piece, flower vase and jewelry box separately. In fifth operation, ANF Peshawar arrested an Afghani National accused Khan Agha from Gate No. 02, Peshawar University, Peshawar and recovered 200 Gram Heroin from the accused. In three separate operations at Motorway Toll Plaza, Peshawar, ANF Peshawar arrested Muhammad Javaid resident of Kohat, Saeed Ur Rehman resident of Khyber Agency and Muhammad Shahid resident of Peshawar and recovered 1.2 Kg, 1 Kg and 1.15 Kg Hashish respectively.